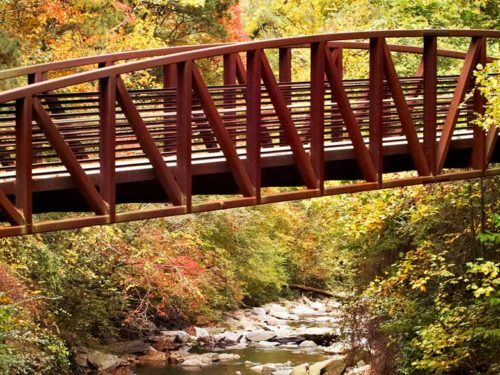 The trail weaves through Cumberland, Cobb’s central business district, connecting 32 million square feet of commercial space with 1,200 acres of pristine national parkland at the CRNRA’s Cochran Shoals Trailhead. The completed western portion of the trail weaves through skyscrapers, one of the southeast’s largest convention centers, and one of the nation’s most vibrant performing arts centers connecting workers and visitors to the area amenities. 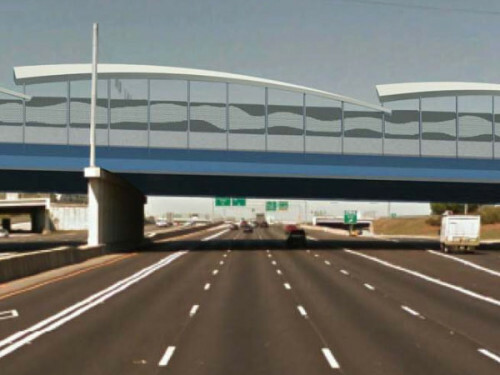 The soon to be complete eastern portion, runs along Interstate 285 across the street from about 5,000 community residents. 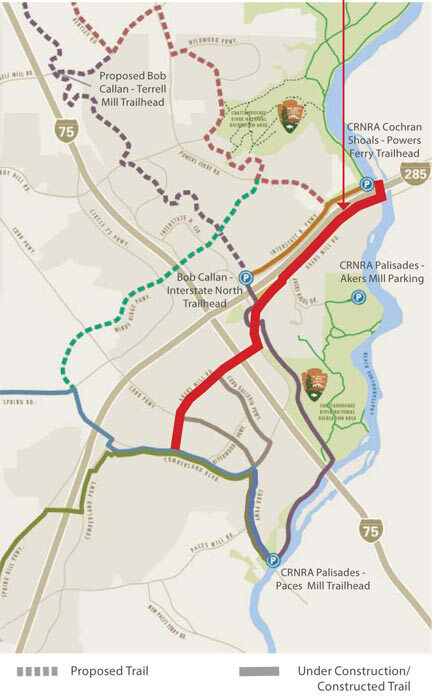 The Akers Mill Trail also has a connection point with the Bob Callan Trail on Interstate North Parkway that allows for north and south pedestrian and bike access through some of the region’s most precious natural landscapes. 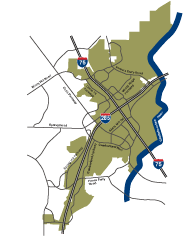 The western portion of the Akers Mill Trail connects directly into the Silver Comet Cumberland Connector, and is in process of connecting the area to Alabama. 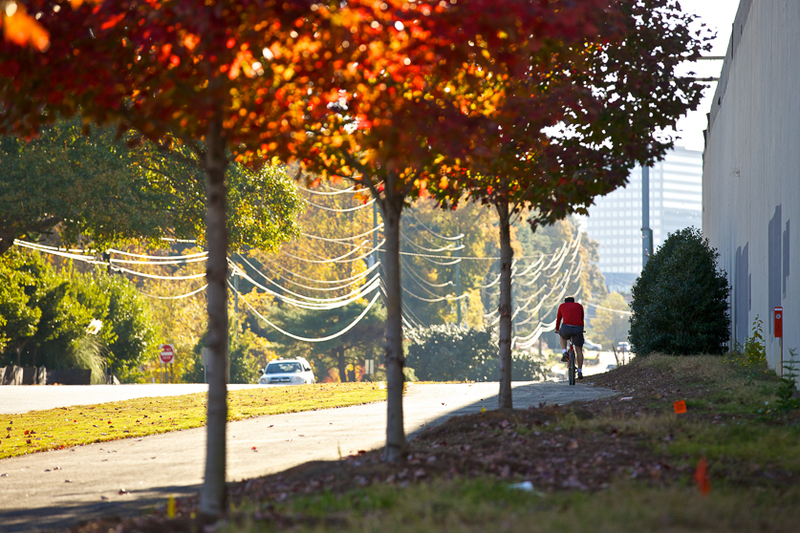 Pedestrian lights and street furniture create a friendly atmosphere for walkers and bikers alike as they wind through the heart of Cobb County’s Cumberland submarket. 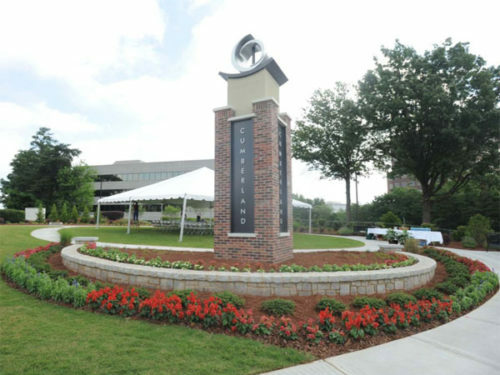 The amenities on this portion of the trail abound, including Cumberland Mall, the Cobb Energy Performing Arts Centre, restaurants, shopping, and the Cobb Galleria Convention Centre. Starting at the CRNRA’s Cochran Shoals Trailhead, users can follow boardwalks and pedestrian bridges along the river and under Interstate 285 to access Akers Mill Road by bike or foot to travel east. The trail intersects with the Bob Callan Trail, which provides a southern connection on a paved trail that meanders through the contoured banks of the Rottenwood Creek and provides access to the CRNRA’s Palisades Trailhead at Paces Mill. Parking is available for $3 at the Cochran Shoals facility or for free at the smaller lot known as the Bob Callan Trailhead located on Interstate North Parkway.